New Delhi, August 10: Biofuel is not just a science, it’s a mantra! It’s a mantra that states the 21st century India is going to give new energy to the fuel that originates from crops, from litter-waste to fuel, from village to city, from the old saying of bringing it back to the roots, believed Prime Minister Narendra Modi as he marked the event celebrating World Biofuel Day in New Delhi. Addressing the event, PM Modi said that the plan to produce ethanol from biofuel was initiated when Atal Bihari Vajpayee was the Prime Minister. After that, a roadmap for the Ethanol Blending Programme was prepared in the year 2014. He further elaborated that besides providing benefit to farmers, this move helped save foreign exchange worth Rs. 4000 crore last year, and the target is to take this number to about Rs. 12,000 crore over the next four years. 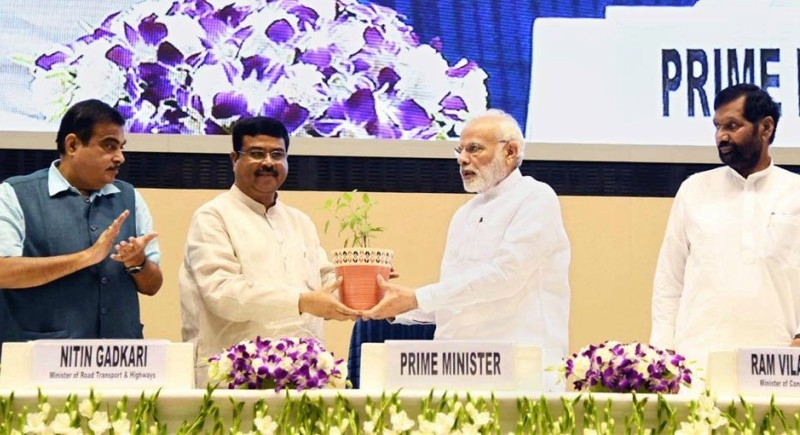 Highlighting that biofuels can provide fresh momentum to India in the 21st century, PM Modi added that it is fuel produced from crops, which can change the lives of people in both villages and cities. He also stated that the government is taking efforts in benefitting the farmers and with this regard many schemes have also been initiated by them. The schemes such as Jandhan, Vandhan, and Gobardhan are helping to transform the lives of the poor, the tribal population, and the farmers. He said that the transformative potential of biofuels can be realized only through the participation of students, teachers, scientists, entrepreneurs and the people. He urged everyone present to help take the benefits of biofuel to the rural areas. The Prime Minister also added that the government is taking efforts to make BioCNG from trash; CNG usage is being ramped up in public transport; we are trying to reduce dependence on CNG import. Further, PM Modi added that the revolution of biofuel shifts from home-house will not only reach the efforts of the Government but also in the participation of students, teachers, scientists, entrepreneurs, mass-mass. He urged everyone to try their level to deliver the benefits of biofuel from village-village. Lastly, the Prime Minister also released a booklet on “National Policy on Biofuels 2018.” He also launched the “Proactive and Responsive Facilitation, by Interactive and Virtuous Environmental Single-window Hub” (PARIVESH).